An interview with Pye Hastings by Alessandro Freschi (Distorsioni), originally published on 26 January 2016, in Distorsioni web magazine in both Italian and English. L’eco infinito della landa grigia e rosa – Italian/English Version. Welcome Pye and thank you again for having accepted this interview. Let me begin our short meeting talking about the starting point of your important artistic path. In the first half of the 60’s you met Richard and Dave Sinclair and the late Richard Coughlan. The horizon of the emerging Canterbury Scene was shaping, and soon after The Wilde Flowers became Caravan. What were the sources of inspiration and the musical passions of the young Pye? I was very influenced by my father’s huge collection of classical music and Show Songs from the pen’s of Gershwin and Cole Porter plus, of course, my brother’s Jazz records. Being so young you are not aware how much these things influence you till much later. Of course the real spark that got me going was the arrival of Rock and Roll music and bands like the Beatles, The Stones and the Kinks. They represented the fact that you could make something of yourself by joining a band and writing your own stuff. Surely this is every boys dream? Anyway once I found out how to play my first few chords, I was totally hooked, and only then did I discover something that I didn’t know existed in me before. I think having an aptitude for something like playing music is a talent that is probably passed down through the genes from your parents. My father played piano, my brother played flutes and saxophones and I took up guitars. I don’t know what my father would have thought of my efforts with a band apart from thinking “What a racket”. He died when I was five years old so I never would find out. In England, the offers that were coming from the music scene of the 60’s proclaimed the success of some movements that were completely different from the experimental themes of your compositions, that were soaked with contaminations that ranged from psychedelia, beat, to reach jazz, in some extreme cases. What were your feelings towards the music broadcast by the radio at that time? All music is great! Some of the playing though, is not so great. The 60’s was a time when all things were changing, and none more so than the music. Hair was grown long and clothing was getting much more colourful. I remember having a conversation with my father in law about this and I said, rather smugly, that we were the first generation for many years not having to wear uniforms; bearing in mind our parents generation had just come through a world war and everyone was in a drab uniform of some sort or another. Military or civilian. He pointed out that if we were all wearing our hair long and sporting jeans and brightly coloured shirts, then surely this is just another kind of uniform? He was of course right, which just goes to show that deep down, we all are somewhat tribal in that we only feel comfortable when we fit in with our peers. The music was a different kettle of fish. Music has the ability to cross generations and appeal to a wide spectrum of tastes. Rock and Roll and Jazz all have their roots in America and no doubt the first inklings of this would have been brought over by the American troops during the last war, so what took us by surprise certainly didn’t our parents. It is the responsibility of the young to take an existing format and turn it on it’s head so when we were listening to bubble gum pop music on the radio, in the 60’s, it just felt right that we should try and jazz things up a bit by introducing influences from other styles of music that seemed more interesting and challenging. This is the joy of being able to write music. It can take you in any direction you choose. The only problem is getting people to like what you are doing. As I said the idea of changing things is good… the getting it right and playing it well is the tricky bit. The Wilde Flowers are to be considered to all intents and purposes the group that initiated the emerging Canterbury Scene. Kevin Ayers, Robert Wyatt, the Hopper brothers and Mike Ratledge are only a few names among the artists who appeared in the line-up of this band that formed in Kent in 1964. Unfortunately, at that time there weren’t the necessary conditions to release an album, I guess, and the unique witness of that period is represented by an anthology of old recordings distributed in 1994 by Voiceprint. What were the real reasons behind the absence of official albums by The Wilde Flowers? The Wilde Flowers never landed a recording contract so the only recordings of the band are amateur tapes done as demos by Brian Hopper, the bands leader and grand father of the Canterbury Sound. The band played mainly in local clubs and bars around the Canterbury area and didn’t get the opportunity to play in London where you could get noticed by record companies. Clearly this frustration was the incentive for Robert Wyatt and Kevin Ayers to move to London and form a new group where they rapidly drew attention from record companies looking for something new. The same could be said about Caravan. If the Wilde Flowers had been successful we probably wouldn’t have the Soft Machine or Caravan. That said, massive respect must be given to Brian for starting the whole ball rolling. Without him, who knows where we would all be? The year of your turning point is 1968: leaving behind The Wilde Flowers project, you, the Sinclairs and Coughlan teamed up forming Caravan, and in a few months you published the debut album, thanks to the American label Verve. Even if, regarding some aspects, the record can ideally represent a transit between the sound of The Wilde Flowers and the following album “If I Could Do It All Over Again, I’d Do It All Over You”, in some tracks you can breathe that compositional magic that will characterize the most important works of the band. Romanticism and experimentation, melted in an amazing chemistry. Pye, with which of these two elements does your idea of music coincide? Both are terribly important but at the time none of us were aware that we were doing anything special. We were just following our instincts and hearts. We all wanted to become successful but we wanted to be different from the others, and the combination of all our talents was the one thing that helped to create something unique. Romanticism is deep in your heart whereas experimentation is your duty. After the consecration of your second album, in 1971 the real masterpiece of Caravan is released, “In the Land of Grey and Pink”. A cornerstone of the Canterbury scene and the manifesto of the entire prog scene. A bright album, with fabulous traits. Pye, forty years have passed since that album. Leaving apart fame and success, and speaking from the artistic point of view, how much was that album important for your career and for Caravan? It is still the most popular album for Caravan fans, just slightly ahead of “For girls who grow plump in the night”. This album holds both joy and sadness for me. Joy, that it achieved such immediate success, which is what we all wanted, but sadness in that it signalled the departure of Dave Sinclair who wanted to seek his fortunes elsewhere. Mind you it also brought to the fore that “no individual member of a company, band or organisation is greater than the platform which you have created”, and it is imperative to carry on. I realised very quickly that I did not want to pack up and go home, just because our star player had quit, and it brought out a resolve in me that no matter what was round the corner, I would carry on and re group. I felt artistically, that I hadn’t really started yet so in that sense it was desperately important for me to carry on. With “Caravan and the New Symphonia” published in 1974 the most inspired period of the band virtually ended. However, the band produced good and interesting albums after that, but the decline of the scene, as well as the repeated line-up changes caused the impossibility to reach the same success of the early 70’s. Besides “In the Land of Grey and Pink”, which is the Caravan album that you cherish the most, and why? To me they are all equally important but the album that I cherish the most has to be the most recently recorded one. In this case “Paradise Filter”. Once an album has been released it is absolutely the most important thing in the world, but very quickly I will begin writing for the next one which in turn will become the most important one and so on. One day I will stop writing and there will be an enormous sigh of relief from all the fans. Soft Machine, Hatfield & the North, Gong, National Health, Quiet sun and many others. And Caravan, obviously. The Canterbury scene is still echoing even if almost 50 years have passed, but almost exclusively in the names of these prestigious line-ups. Why in your opinion, once the Golden Age of the scene was over, nobody could revive with new blood this fundamental trend of the progressive movement? Progressive music is exactly what it says it is. It progresses, or so it should. So the way we played what became known as progressive music in the 70’s does not mean that other bands have to play exactly the same way as us. It is their duty to take what we started and run with it, changing the format to suit their own styles and fashion. I am sure there are many bands around who are fully capable of carrying the flag forward. So the responsibility lies not only with the new bands experimenting with their sound and whatever influence they can take from us, but also with the fans who should have an open enough mind to accommodate different directions. Whichever way it goes, it has to be good! Pye, to all purposes you are the centrepiece of Caravan, the constant central idea that was the reason why this musical discourse has never been interrupted, giving joy to a large group of fans all over the world. After forty years what kind of feelings do you experience when you perform on stage songs like “Nine Feet Underground” or “Winter Wine”? Has the feeling with your audience changed over the years? Do you have some funny stories to share with us about your live performances? How do you consider your relationship with the Italian audience? I thoroughly enjoy being the leader of Caravan. A lot of things have happened during my time in office and the one constant thing really has been the appreciation and love that we get from the fans. You always hope that what you write and record will be appreciated but never in my wildest dreams did I imagine that 40 odd years later we would still be playing numbers like Nine feet underground to audiences all over the world; and going down better now than when we first played them. 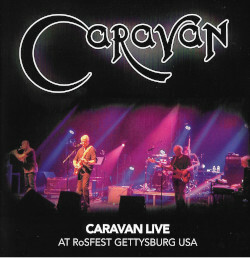 The most impressive thing however has to be the number of young fans who have now discovered Caravan’s music. This is particularly encouraging, because it demonstrates to me that we have been able to span the generations and not get stuck playing to an ever decreasing number fans who are now known as “boring old farts”. My age dictates that I am one of them! Hope is what we expect and get from the youth of today. So when I look out into the audience and there is a sea of young faces looking back and singing along to all the old songs, I feel a great sense of pride that perhaps we have done something right after all. This is particularly true in Italy where everyone has a better voice than me anyway but where there is a healthy, growing movement of young people who, having experienced Caravan music for the first time, still take the time to come and see us play. Who could ask for more? The welcome we get in Italy is like no other!!! From the glorious Canterbury scene in the 70’s until today the world of music has gone through enormous changes. Trends have passed and modern society is very far from the society who fell in love with In the Land of Grey and Pink. In 2015 what kind of music do you listen to? Among the new acts of the music scene are there artists that you like and in which, after due consideration, you can see the kind of creativity typical of your band? Are there recently-issued records that you liked? As I said previously, I like all music, to some extent or another, and I will listen to anything that comes my way. I will pick what I like out of the bunch and move on. No favourites!! My weakness however is still for a good song, good arrangement and good harmonies. Everything else gets put on the back burner. Never discarded!! Music has been my life for the past 50 years and I hope for quite a few years more. As you can see from the number of albums we have released, we have constantly been influenced by the changing trends of musical tastes at the time. This is an important part of “Progressive Music” in that it must progress and not get bogged down in pompous egomania which is how some people view the genre. The recent decision to perform live again, and the release in 2013 of “Paradise Filter” are some clear signs of a new enthusiasm, of the will to always look ahead. What does the future hold for Caravan? I hope Caravan continues for a long, long time yet. We are still as enthusiastic now as we ever have been. Playing and recording is the lifeblood for me and in the next couple of months we are really looking forward to playing in Japan and the Cruisetotheedge.com followed by a “one Off” in Mexico City in November 2015. Our agent, Nigel Kerr of ABS Agency, has already booked a tour of the UK in March of 2016 plus dates in Holland and Germany so it would be wonderful if we could add a couple of festival dates and return to Italy later on in the year. Any promoters out there please contact Nigel, I am sure he will be able to sort something out. Fifty years of music, fifty years of meetings and collaborations. Pye, who would you like to thank the most for their importance in your career but also in your life? Wow what a question? Firstly my father for passing on the musical gene and most importantly my brother Jimmy who put me back on track so many times when I was dis-illusioned by the music business. All the various members of Caravan throughout the years who have shared their talents and most importantly “The Fans”… Without you this would not have happened. I would like to thank you again for your kindness, Pye. I have one last question: music listening devices have gone through dramatic changes from the 60’s until now. From vinyl to CD, and last but not least the super recent “seamless listening”. How do you perceive this metamorphosis of the music industry? I am worried by the changes in the music industry, particularly by the trend for all music to be free. I have done other things to pay the bills when times were hard but have always gravitated back to music as my true career in the understanding that I would, at least, be able to pay my way. I wouldn’t expect to get a house or a car for free. Someone has had to design and build these things and surely the same applies to music. If we don’t get paid, we don’t eat! I accept that technology has advanced beyond our wildest dreams and it is wonderful to have the latest gadget to play music on( which of course we are all prepared to pay for) but if the music writers don’t get paid then the whole recording process could dry up and we would be stuck with listening to “Boring Old Fart Music” for the rest of our lives. Thank you. This entry was posted in Interviews and tagged Pye Hastings on May 1, 2016 by caravan.